Are you looking for a language class for yourself or for your kid? You need not step out and spend a lump-sum amount any more. Now you can get to learn as many languages you want going free of cost as there are a number of language learning apps waiting for you. They are free to use. 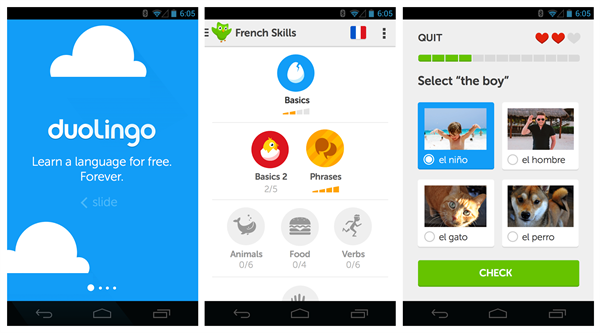 Duolingo is one such app which is now been one of the most popular ones. Have a look at what and all it has packed in its courses. First I came to know about this Duolingo App through the free advertisement of my Windows 10 Menu Bar. Out of curiosity, I got to know that it has by the time become a widely popular app, that boasts of having over 25 million number of users. It all started in 2013, when it was chosen by the Apple for its iPhone App. But now even Windows users can use it by downloading it directly from the site and it is a completely free app, which can be used on your phone or on your computer. Duolingo has hit the world of linguists and language-learning students by offering them a tool that is having a clean and clear teaching method that goes easy with every level of learner who wishes to learn a language well along with the right usage of the terms. They have made an easy way out for learning a few languages and they are not charging the learners any money. The website has its and mobile companion app ready so that, you can keep a learning as many languages you want, utilizing your travel time and whenever you feel curious about a particular term used in a language. 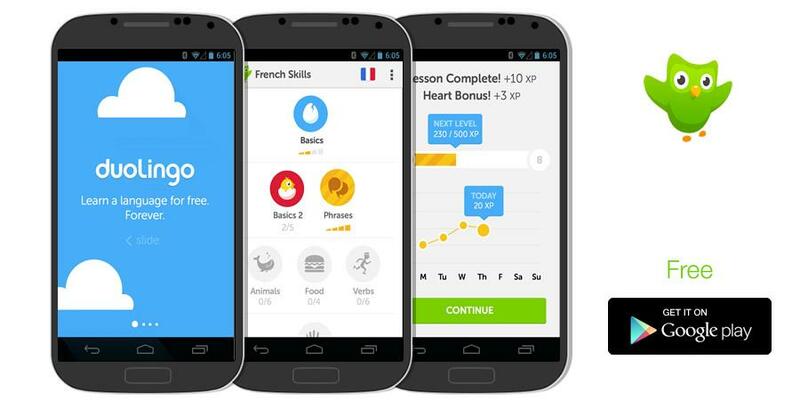 The concept of Duolingo caught the fancy of the crowd mainly as a free language-learning app which has a platform of crowdsourced text translation. The existing version of the app is offering 5 language courses to the English speaking learners and they are French, German,Latin American Spanish, Brazilian Portuguese and Italian. They have a variety of other courses as well as which are mostly used by American English speakers, and even for Spanish and French which are open to the native speakers of other languages like French, German, Spanish, Portuguese, Italian, and other ones. To start learning with Duolingo, you have to sign up with your email address and set a password for the account, or else you can also choose to sign in through your Facebook or Twitter accounts. Once you sign in, the home screen will welcome you and guide you through a roadmap of what and all are there for you to learn. Once you get to see the list of languages, go ahead by picking up the languages that you wish to learn from the list and for advanced learners they have kept the option to choose as many languages one wants to learn. 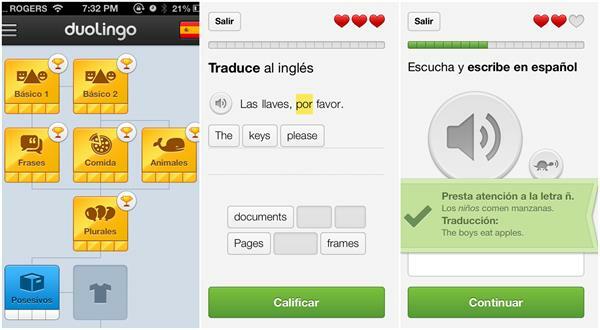 The exercises in the app includes listening, reading, writing and speaking. Speaking here means talking into a voice-recognition system as there is no option of live interaction with teachers or other students in Duolingo. So if you find that speaking out loud in a language is making you feel uncomfortable, you can choose the option to turn off the speaking exercises. As you proceed with your learning, Duolingo will keep a track record of your learning process and also the level of participation you are able to contribute. Exercises are build one on the other in order to introduce the learners to the words and concepts at the right point of time in the entire course of learning. The lessons consist of multiple-choice questions, with tasks like listen-and-write, translate from one language and the vice versa, and lastly some spoken exercises as well. 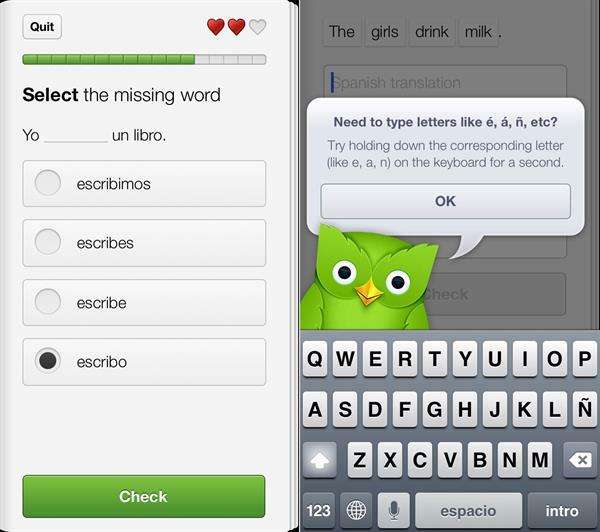 Duolingo uses the technique of crowd-sourcing for its content. For example, if any user finds anything doubtful in the given exercises of the language-learning session, they are free to discuss it out, question it, and even request for a solution from the Duolingo team support. The other prominent feature of this app is that it translates real content from web, which makes it easy to get the term of every word that you feed in, and get the term translated into the language you are looking for. Moreover, News items, blogs, Wikipedia articles, and all other online content which are written in the language you're learning would get stacked into Duolingo, and each learner can translate it into their native tongue to know the actual usage of the term and learn the nuances of the language they are learning. Students are free to correct each others assignments and can cast their vote on the set of translations that they feel are correct. The learning exercises of Duolingo makes you feel at home as they don't make much fuss about typos. If one types any wrong spelling accidentally or misspell a word, the exercise would still be marked as a correct one, but to make you aware of it, Duolingo will surely point it out as we find in the Spellcheck feature of Microsoft Word. The usage of special characters in Duolingo also plays a vital role in teaching you a foreign language. You get symbols and special characters like upside-down question marks and also for different accents for each alphabet. You will get to see and use this Option as they would always appear as clickable icons on the screen whenever the app finds it relevant. It will allow you to choose among them the one which you need without the necessity to learn the complicated keyboard shortcuts. To move forward you can simply press the Enter key. Duolingo is Free. So it is a very useful app for each and everybody to pick up several languages without having to invest in money. The instructions of the app is quite easy on the mind. There are options of practicing the language usage through translation with the help of real-world texts. It is easy to check out a member's learned skills in regular intervals. It is even useful for children. Right now the app could accommodate only ten languages with complete support. There isn't any option yet for live chat or any interactive activity to be conducted with other members. Duolingo is an app that combines unique features and a neat and clean interface which make it quite inviting a platform for learning different languages. To strengthen one's skills in several languages it makes a good choice as a free language-learning program that makes you ready for the world without having to invest in extra time and money.